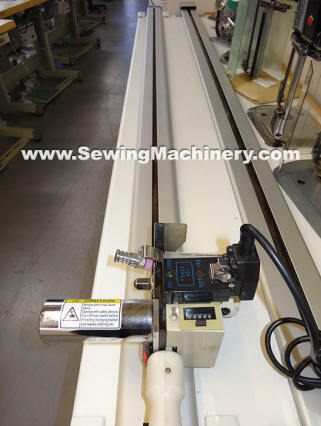 Cloth cutting machine head with rotary blade, counter blade, sharpener, counter, counter weight and manual push/pull handle. Cutting end track, with mechanical lifters, for mounting onto your own cutting table up-to 245cm wide or smaller. Maximum fabric end cut width up-to 215cm approximately. Cutting track is easy to modify to suit mounting on table widths from 100cm to 245cm. Simple to install and used by clothing and textile manufacturers. Cutting head with rotary blade, counter blade and self sharpener. 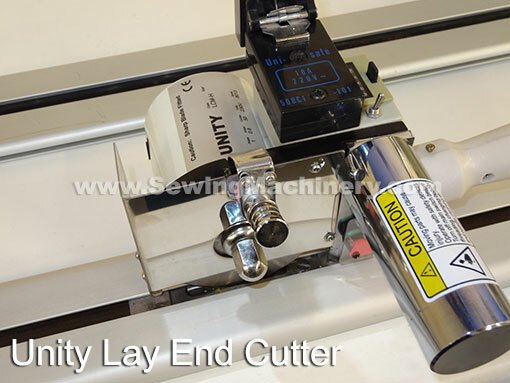 Track mounted for easy straight line lay end cutting. Simple to use manual lifting device. Can be used on tables up to 245cm wide. Cutting width up to 215cm.